Summer is here! The grill is out and it’s time for easy, light meals. This Citrus Balsamic Grilled Chicken is one of my go-to faves all summer long. I can make countless variations of it and never tire of the sweet caramelization of the balsamic combined with the tang of the citrus. The flavor combo gives the chicken so much flavor, it will taste like you spent hours of work making it, when in fact, you only spent minutes. Score, score, score! Marinade your chicken for 2 hours if you can. In a sealed ziploc bag. Use a high quality white balsamic vinegar. They are not all the same. I pay a little extra and get mine at an olive oil and vinegar shop. Flip it every 30-60 minutes if time allows. Don’t be shy with the seasoning. Food needs salt to bring out the other flavors and pepper will add flavor. You must salt and pepper your chicken before it goes on the grill. Preheat your grill. You should hear a sizzle when your chicken hits the grates. 15 minutes is a good rule of thumb. Let your chicken set out for the time your grill heats. You don’t want to put your chicken on super cold. Typically, your protein is ready to flip when it doesn’t stick. BUT, make sure you have oiled or seasoned your grates according to what’s necessary for your grill. Try to have your chicken cut evenly, in like size pieces, so they will cook for the same amount of time. Don’t skip the basting. 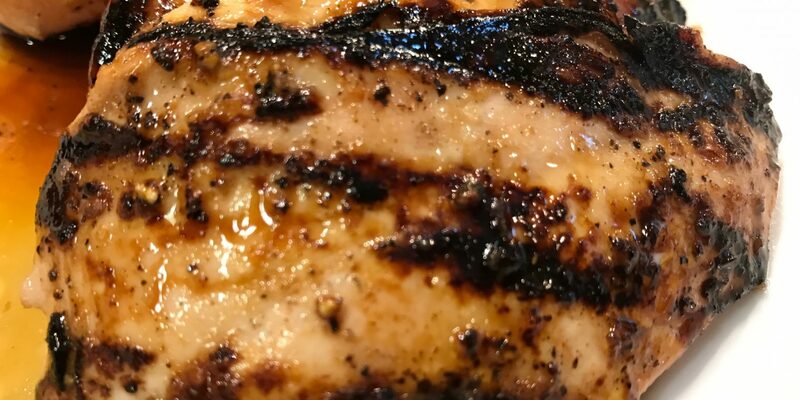 It’s a small step for just one side of the chicken, but that extra 3 TBS or so adds some extra flavor and moisture to your chicken. Chicken needs to cook to 165F, but I like to cook mine to 160F-162F and let it rest for 5-10 minutes. It will continue to cook and get to 165F or higher in that resting time. Plus, the resting ensures that it retains its juices. This is critical for any meat, but especially for a low fat meat like chicken breast. If your meat is dry, chances are you overcooked it and/or didn’t let it rest. As your chicken rests beautiful juices will seep onto the dish. This is gold! When you serve the chicken you can spoon this juice over your chicken. You’ve created jus while grilling!! Don’t like white Balsamic vinegar? Try Sriracha Lime Marinade on chicken instead! 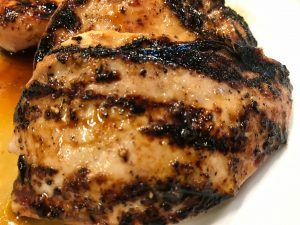 You can make this Balsamic Chicken without the citrus or just one of them and it's still delicious! Clean chicken breasts and put into a 1 gallon ziploc bag. In a small mixing bowl whisk together the balsamic vinegar, olive oil, and zests or oil (if using). Whisk until emulsified (blended together). Reserve 3-4 TBS in a separate small bowl for basting. Cover. Pour the rest of the marinade over the chicken and pop in the fridge for a couple of hours. Try to turn the chicken every 30 minutes or so, if possible. Preheat grill about 15 minutes before grilling and pull chicken out of fridge. Discard excess marinade and lay chicken flat on a sheet pan or baking dish. When grill is hot, lay chicken down on the first side cooking 4-5 minutes, depending on the size of the breasts. Re-whisk remaining marinade if it has separated. When chicken is ready (not sticking), flip breasts and baste the cooked side with reserved marinade. Cook second side for another 4-5 minutes or until done. Chicken cooks to 165F, but you can remove it at 160F and let it rest for 5-10 minutes, as it will continue cooking to 165F and reserve its juices as it rests.